Home/Informational Guides/vSAN : What is VMware vSAN ? vSAN : What is VMware vSAN ? VMware continuously changing & improving the traditional datacenter with software defined datacenter(SDDC). VMware SDDC consists of all the components which are virtualized which are compute, storage & network. Compute is you already know which is vSphere ESXi , Network is virtualized using the VMware’s NSX Solution. For storage VMware provides the vSAN which is an software defined storage. Now a days you will see that many companies provides the virtualized storage solutions which are called as Virtual Storage Appliance (VSA). 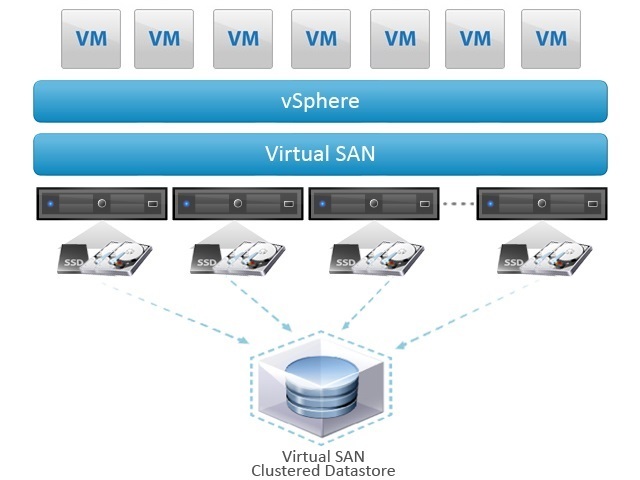 VMware has announced their own software defined storage called vSAN in March 2014. That was an initial release but from March 2014 to till today vSAN is completely improved and many features have been added into it which provides performance, reliability, security. vSAN completely changes the way in which storage is configured and allocated or mapped to the compute ESXi hosts. VMware vSAN is an software defined storage solution from VMware to eliminate the need of the additional storage boxes using the local server storage. In simple word vSAN abstracts the local storage of ESXi hosts & make a pool of it to be used as an shared storage which is very much optimized. So as you are using the local storage you will not need an additional storage boxes for the storing files which also helps in lowering the Total Cost of Ownership (TCO). vSAN is very easy to use solution. Where with few click you can create & configure the storage pool. 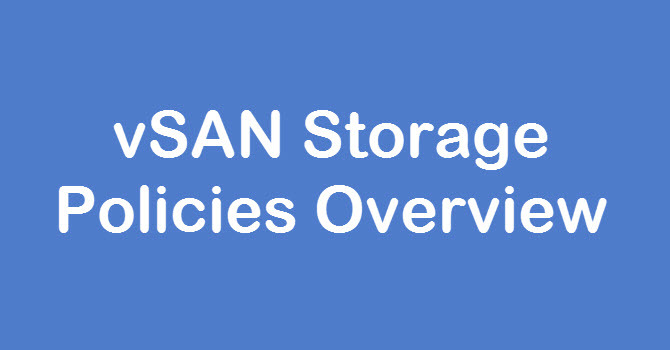 vSAN also provides the policies referred to as SPBM (Storage Policy Based Management) which can be applied to a single VM or a single disk based on the requirements. There are many server vendors which provides the vSAN ready nodes which are optimized & also the VMware certified. So you can easily choose from your preferred vendor which solution you likes to use. As you can see in the above image of vSAN Architecture you will easily understand what is vSAN & How it works. vSAN is an Virtual Clustered datastore which uses the local storage of ESXi hosts & create a logical pool of the storage which is then presented as the datastore to the ESXi hosts. vSAN datastore supports all the features of vSphere such as vMotion, Storage vMotion, HA, DRS etc. vSAN is an object based storage system which uses VM storage policies to make placements of a virtual machine with the right configurations. vSAN is already embedded in the Hypervisor so you don’t require any additional installation of Appliances. There are some requirements & prerequisites are also there which needs to be checked before enabling or using the vSAN. Which we will discuss in the Next post. Software Defined : It is completely software defined solution. Integrated with vSphere: vSAN is integrated into ESXi itself so you don’t need any additional installation. Which also helps in minimizing the CPU & Memory usage while improving performance. Simple: It is ridiculously simple to configure and operate. Flexible : vSAN can be easily scale up and scale out whenever required. Storage Policies: You can configure the different storage policies on per VM or per Disk basis. It helps in automate provision and balancing of VM Storage. Deduplication & Compression: vSAN supports the space saving features such as Deduplication & Compression. Encryption: vSAN supports encryption of data which is storage in the vSAN datastore. It provides data at rest security at the cluster level. It uses AES 256 cipher for encryption. Erasure coding: vSAN Erasure coding (RAID-5 6) which is capable of tolerating failures by single or double parity protection. All Flash or Hybrid: vSAN supports all flash as well as hybrid architectures where Flash disks will be used as cache & Magnetic disks will be used as capacity. This are the Key features of vSAN but there are many more features are there which improves the vSAN Solution & provides the complete software defined storage. vSAN comes with an included health check feature which checks the vSAN health every 60 minutes by default that value can be changed based on your requirement. vSAN health checks & monitors various components such as Hardware Compatibility, Verification of Storage Controllers, Disk & Cluster health, consumption, Network connectivity & throughput many more are there. vSAN Health proactively monitors the environment for performance & availability. If your vCenter Server goes down then also you can monitor the vSAN health using individual ESXi hosts. vSAN comes with the configuration assist which helps in ensuring the right configurations, Device drivers & Device firmware’s. vSAN configuration assist checks for the vSAN Configuration, Hardware compatibility, Network configuration & provides the recommendations based on that. 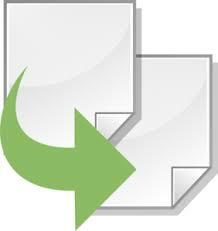 It also provides an option for Download & Install the latest supported software. vSAN Configuration Assist identifies the various problems & provides the ways to resolve it with few clicks. For using vSAN you need to buy the vSAN License to enable & make use of vSAN. vSAN license editions include Standard, Advanced, Enterprise, and Remote Office/Branch Office (ROBO) Standard, Advanced, and Enterprise. vSAN Standard, Advanced, and Enterprise editions are licensed per-CPU (socket). They are available as standalone licenses and are not included with VMware vSphere® or VMware vSphere with Operations Management™. Any type of workload—server and desktop—can be run on a vSAN cluster with these licensing editions. 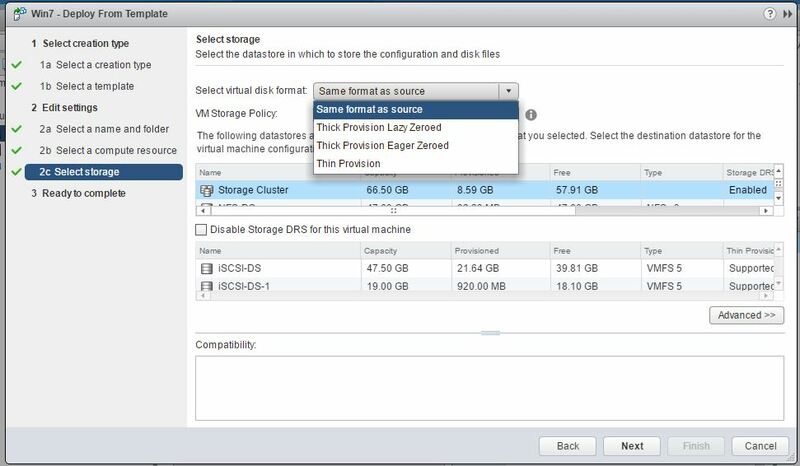 A vSphere host that is not contributing local storage to a vSAN datastore can be a member of the vSAN cluster and utilize the vSAN datastore. Even though a host is not contributing storage, the host must be licensed for vSAN. 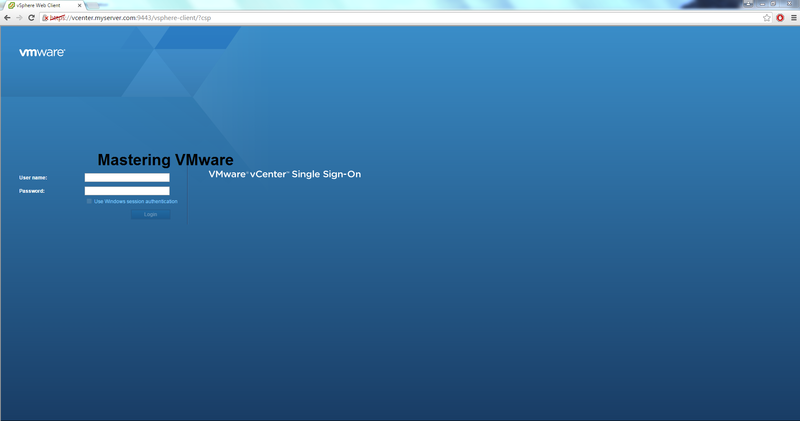 For more information on features & other details you can refer to VMware Website. 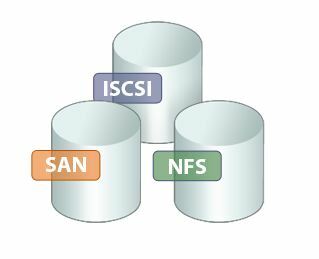 vSAN uses disk groups for magnetic disks and flash disks. You can create a maximum of 5 disk groups per host and each disk group can contain one cache disk & 7 capacity disks. It is recommended to make the multiple disk groups instead of only one disk groups per host if your have greater disk count per host. vSAN can be used with the High Availability. But before enabling vSAN, HA should be disabled then you can enable the HA once the vSAN is configured. Note: The deduplication & compression and RAID-5/6 erasure coding features require an all-flash vSAN configuration. These features are not supported with hybrid vSAN configurations. vSAN Hybrid vs All Flash Overview. What is Disk Group in vSAN ? vSAN Objects and Components Overview. vSAN Deduplication and Compression Overview. How to Create vSAN VMkernel Step by Step ? How to Configure vSAN Step by Step ? 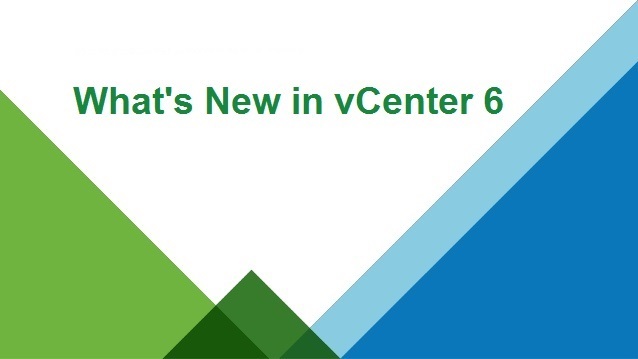 Note: Above specified requirements and details are of vSAN 6.6. Join Our LinkedIn Group to get Fast updates about our posts : Mastering VMware. 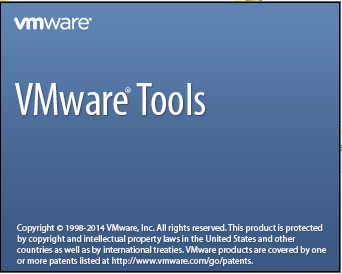 What is VMware Tools ? Disk Types in VMware ?